Bexhill United Football Club joint manager Ryan Light was 'massively proud' of his players in the Boxing Day derby against Little Common. The Pirates led for more than hour before Common struck twice in nine second half minutes to clinch a 2-1 victory in a very watchable Macron Store Southern Combination Football League Division One affair. "I'm obviously disappointed to have lost the game, but massively proud of the performance," Light said. "People have come here and seen two good sides on a bobbly pitch and I thought we gave a really good account of ourselves." Light disagreed with the decision to award Common a penalty which led to their equaliser. The referee, incidentally, also gave a spot-kick against Bexhill the previous time he took charge of them against Storrington in November. "The game was turned on the usual refereeing decisions," Light continued. "(Bexhill left-back) Craig Ottley stood still, and the lad (Common midfielder Harry Saville) ran into him and dropped on the floor. I think at worst it's obstruction and an indirect free kick; it's a very soft penalty. "The penalty changes the game because you lose the momentum. I thought we were quite comfortable at 1-0. Second half they weren't really creating many chances and I thought we probably could've seen a 1-0 out. "The penalty deflated us a little bit and players strayed a little bit from their roles at 1-1. We're disappointed to concede from a set-piece (Common's second goal was a Dan Cruikshank header at a corner); historically we don't concede from corners. "There was really nothing between the sides. We looked dangerous on the break and they looked dangerous in the final third, which they're going to do when they've scored 60-odd goals this season." 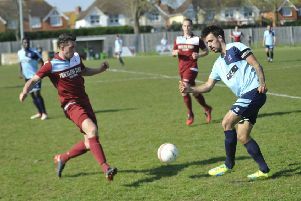 Bexhill will end 2016 in mid-table, but Light says the young team he and fellow joint manager Nigel Kane have assembled isn't far away from the level he wants it to attain. "We're four months into the job; I think Russell (Eldridge, Common's player-manager) has been there seven years," he went on. "If we're still here in seven years, I would hope we still wouldn't be in this division. "We're not far away at all. We've got to find a way to win a game from a winning position. We're on a little bit of a losing habit and they (Little Commo) are on a winning habit, and they believe they can win the game. "Their front players are lively and quite clever in their movement. I think they were more dangerous in the first half than they were in the second. They've scored 60-odd goals and we've not conceded from open play so we can take positives. "They (the players) are bitterly disappointed, but the performance was absolutely fine. Kyle Holden was absolutely outstanding at right-back; him and Drew Greenall were the stand-out players." Bexhill will kick-off the new year with a home game against Langney Wanderers on Monday, kick-off 11am.